Iota Horologium is very similar to our own Sun, and has a Jupiter- like planet that orbits in just under a year. The star seems to have escaped from the Hyades star cluster. 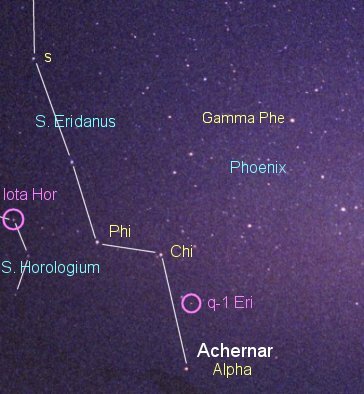 The left-hand circle shows the location of the class G (G0) dwarf star Iota Horologium, which is found in the deep southern end of the constellation to the east of Eridanus, Achernar, and another planet-holding star, q1-Eridani. Iota Hor's planet, with a mass at least 1.94 times that of Jupiter, orbits with a period of 311.3 days, or 0.85 years at an average distance of 0.91 Astronomical Units (136 million kilometers, 84.6 million miles), not too much different from our own Earth. A modest orbital eccentricity of 0.24 takes the planet from as far as 1.12 AU from its parent star to 0.69 AU, from somewhat larger than the orbit of the Earth to about the distance of Venus from the Sun. Iota Horologii is a fifth magnitude (near sixth, 5.41) near-solar clone, a class G0 dwarf star in deep southern Horologium not far from first magnitude Achernar. From a distance of 56 light years (near its planet-holding neighbor, q-1 Eridani), it shines with a luminosity 1.6 times that of the Sun, with surface temperature of 6160 Kelvin, just 380 Kelvin warmer than solar. That combination gives a radius 13 percent greater than the Sun and, along with measures of the star's subtle surface vibrations, a mass of 1.2 to 1.25 times solar. Like most stars with planets, Iota Hor is metal-rich, with an iron abundance (relative to hydrogen) 50 percent greater than that found in the Sun. Iota Horologii has the same motion as the Hyades star cluster, from which it was apparently ejected, the relation supported by similar metal contents, helium abundances, and ages of 625 million years. The star is now separated from its parent cluster by 130 light years. The similarity in iron abundance shows that Iota Horologii's own high metal content is intrisic to its birth, and is not the result of accretion of its own close-in planets. Written by Jim Kaler. Return to The Planet Project or go to STARS.